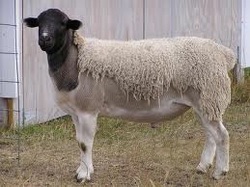 Dorper sheep are a medium bodied, mild temperament, easy lambing sheep that are good mothers. 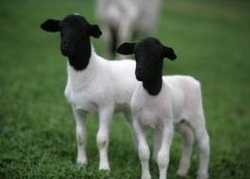 As a hair sheep, they shed their short wool each summer and their meat is considered sweet. The sheep are a useful tool at Ohadi in keeping forage in check. They are also in herding trials, weed control and meat production. With a lack of USDA approved processing facilities in the valley that are booked far in advance, it is difficult to offer fresh lamb to the public. 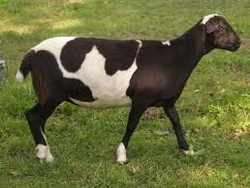 Ohadi is working to develop a method to offer the sheep to the consumer market. At this time the sheep are sold on the hoof at the ranch. In addition, a limited number are offered each year for those that wish to grow out a lamb for a fall harvest. Inquires welcome to discuss your needs.